By the time you read this On Landscape will have moved offices - which by implication means that we will have moved house as well. The change in scenery is only minor, it’s 5 miles from our old house, but that means that the ‘back yard’ is completely new and I’m looking forward to making the most of it. And I have a bunch of new equipment to try out in it too! Rob Cook from Canon has kindly arranged the loan of a Canon 5DS and separetely Paul Reynolds from Sigma has loaned me the whole of the Sigma ‘Art’ range of prime lenses; the 24, 35 and 50 f/1.4. The two of these together add up to a serious bit of equipment and I’ll be putting them through their paces for On Landscape in the coming weeks. However - it all starts this week by laying the groundwork with a review of the reviewers (often referred to as a meta review). I’ve analysed the online testing of the Sigma 35mm f/1.4 and summarised them into something a little more digestible. Along the way I have also critiqued the testing websites themselves. As I’ll be doing some testing myself in the future (not too much, don’t worry) I though it best to set a baseline. Don’t worry though, there’s lots of photography in this issue too! 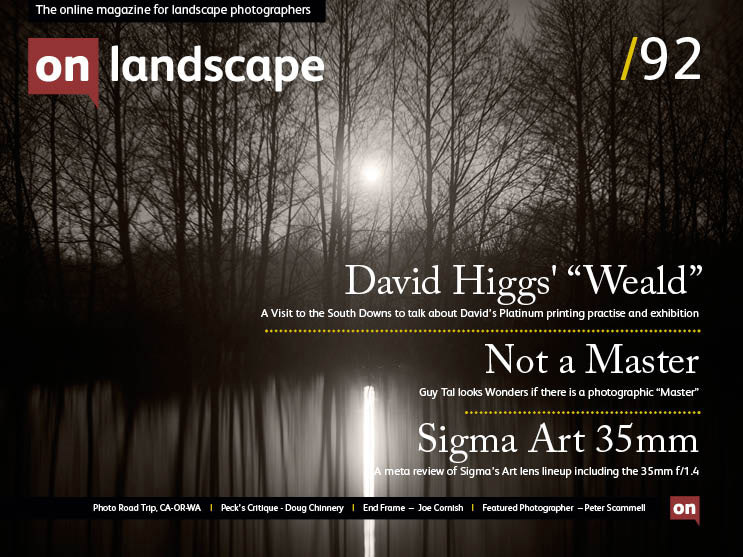 From Guy Tal’s essay through Steve Gledhill’s US road trip and onto a chat with David Higgs about his wonderful platinum palladium work “Weald”. And finally we also have a new feature from Thomas Peck, who wrote an essay on the sublime recently. 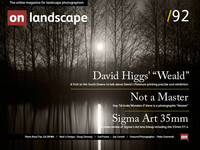 He is discussing some inspirational landscape photographs and has started in this issue with a work by Doug Chinnery.